Jim Tate was fired on August 17th. Board member resignations. Viral rumors on social media. Tax-paying citizens turning out en masse to demand answers. At the center of it all? The Clinton County Humane Society. What started out as a personnel dispute may turn out to be a harbinger of much larger financial problems in the county. Frankfort City Council meetings don’t usually start like the one on Aug. 27 did. The crowd was so large the gathering had to be moved out of the compact council chambers, and a piercing whistle alerted the room it was time to begin. Ben Pfeffer, the interim director of the Clinton County Humane Society, stood before the throng. At that, the crowd -- already restive -- began rumbling loudly with frustration, forcing Mayor Chris McBarnes to call for order. So how did we get here? Here, in this case, being at a table in the Good To Go gas station off of Interstate-65. “My former occupation was the director of the Humane Society of Clinton County,” says Jim Tate, who was fired by the Clinton County Humane Society board last month after eight years as director. 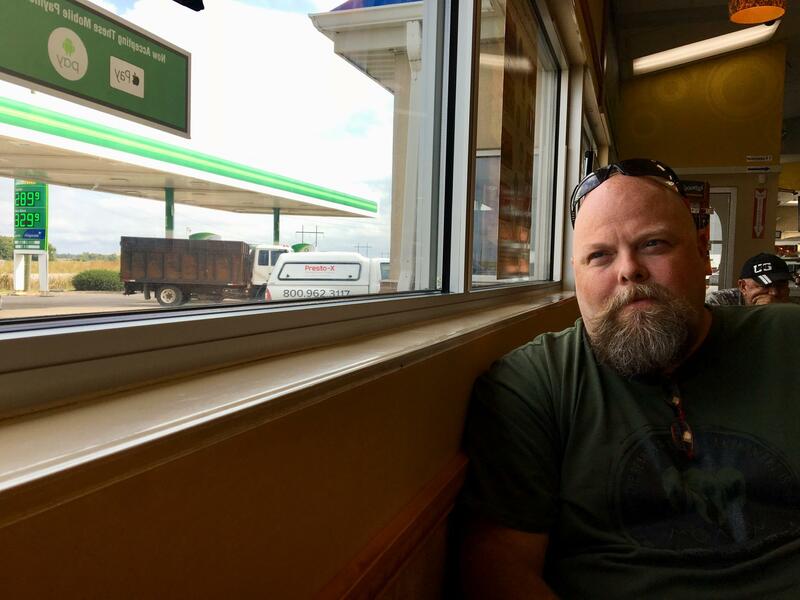 He sports a beard and a bald head, and his cell phone ring is the rev of a motorcycle engine. Many of the people at the city council meeting spoke in support of him, and three of his employees walked out when he lost his job. Ultimately, Tate thinks the board didn’t do enough to support the small shelter staff—which he says made it impossible to take care of every task, thus offering the board an excuse to show him the door. Tate says when he was fired, he was given two main reasons: he personally changed the lock on his office door, and he wouldn’t provide the passwords to the Humane Society Facebook page and website. His wife had created the pages, which he says gave her ownership, and the couple decided to simply shut them down after the board asked for access. Tate was also given a two-page list of job expectations four days before his termination. “They set the bar high enough to where I’d fail,” Tate says. He also believes the bigger issue for the board was the passwords. “When they started asking for passwords, I thought something…something’s coming up,” Tate says. The man who told Tate he was fired was Humane Society board member and Frankfort lawyer Tom Little. 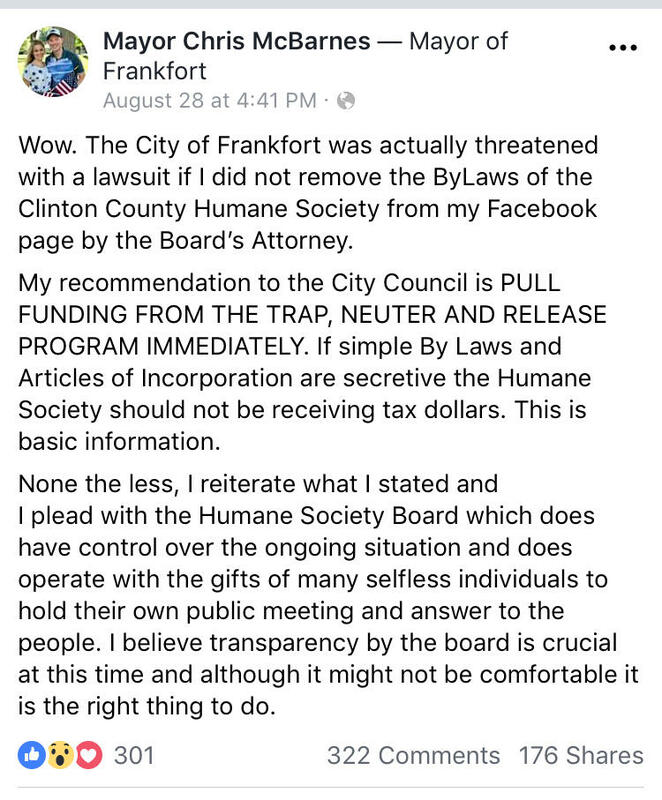 Little also figured in a later dust-up with Frankfort Mayor Chris McBarnes, who'd posted the Humane Society's bylaws on his Facebook page. Little threatened to sue the mayor's office, and McBarnes took the post down. Little says the organization does not receive enough taxpayer money to be required to make such documentation public. Hundreds of people weighed in on Mayor Chris McBarnes's Facebook post about the Humane Society. "We're proud of our bylaws," Little says. "We have nothing to hide. It's just that if our bylaws are going to be posted, we're the ones that want to do it." The incident has led McBarnes to recommend stripping city funding from a trap, neuter, release program for feral cats -- funding board president Nancy Elsea cannot seem to account for. When asked if she knows why they weren't available, Elsea simply responds: "No." At the Aug. 27 city council meeting, Humane Society leaders were supposed to be making a financial case for the TNR program. Frankfort appropriated $10,000 in the first year, and upped that to $20,000 in its second and third years. Elsea says TNR costs aren’t limited to veterinary fees, and include wear and tear on the vehicles used for transporting the animals, and the salaries of staff who trap and look after the cats. But in a copy of a proposed Humane Society budget for 2018, only $3,500 appears to have been allotted as a line item for the program. Elsea claims the rest of the $20,000 is spread throughout the budget. “I mean, I look at that and say, “Can you tell me exactly where every penny went at the county highway [department]?" Elsea says. At a July 3 county commissioners meeting, Elsea asked for an increase in the Humane Society budget. In a recording of that meeting, she describes the Humane Society’s relationship with a Purdue University program that offers free surgical procedures, saving the county approximately $25,000 a year. But there’s dispute about what she says next: "We do not have that this year." Elsea appears to be saying that one reason she’s asking for another $5,000 is because Purdue vet students and a mobile surgical rig won’t come to Frankfort any more. The problem is: that’s not true. E-mails confirm Jim Tate had scheduled several visits for the rest of 2018. The Priority 4 Paws mobile surgical unit. “I am not aware that there was any discussion about not calling on them or anything,” says Lynetta Freeman, who started Purdue's Priority 4 Paws program in 2012. She says the Clinton County Humane Society was one of the first participants, and has been an important resource for years. “I consider them a very significant partner in the teaching of our students,” Freeman says. Tate says he confronted Elsea, telling her he wanted to alert the city and county to what he saw as deception. He also says she told him he would regret it, if he did. Elsea disputes Tate’s version of the events. Elsea has not provided any proof of a change in the relationship between the shelter and the Purdue program, despite repeated requests. So where does that leave the Humane Society? Out at the shelter, Ben Pfeffer is walking from cage to cage in a room filled with cats. Pfeffer took over the Humane Society on Aug. 19, two days after Jim Tate was let go. He says he’s spent his first weeks at the shelter cleaning and organizing. Several board members have resigned this year, citing the board’s lack of support for Jim Tate and his staff. They've also taken issue with the board's reluctance to spend money on needed maintenance. "All of the agendas that I would receive and all the meetings I would go to, we would bring up the drain grates, the drains -- how bad they were -- the mold in the ceiling, the kennel gate, the west end kennels needed roofs over the top of them, and it would all be shot down, every time," says Carin Moskovitz. Why wouldn't the board approve spending on needed maintenance? “It’s not in the budget, it’s not in the budget, it’s not in the budget, we can’t do that right now, we can’t do this right now,” Moskovitz says. But the budget may not have been as lean as board members suggested. Moskovitz confirms what tax documents from 2016 appear to show: that the board likely had about $85,000 in cash it could have allocated to rodent control, fixing a dilapidated building, buying new equipment, or even paying for the spaying and neutering that Purdue would no longer do – if that had actually been an issue. Not keeping track of finances is something city councilman Jim Moyer says elected officals haven't done well either. There are many questions left to be answered about money. What happened to the other $16,500 not included in the TNR line item in the Humane Society’s 2018 budget? When concerns were raised about building upkeep during Jim Tate’s tenure, why didn’t the board vote to spend some of its cash on hand to solve those problems? Will the city, which suddenly has concerns about where its money for the TNR program is going, decide to discontinue that funding? And is the Humane Society’s budget conundrum indicative of a larger problem in Frankfort and Clinton County? Do government boards give out money and regularly fail to check up on how it’s spent? The questions could be answered with an audit – or with legal action that compels people to answer questions they haven’t wanted to address thus far. EDIT: An earlier version of this story suggested the county commissioners were still considering whether to give an additional $5,000 to the Humane Society based on Nancy Elsea's request. County Commissioner Scott Shoemaker says the commissioners have denied that request and told Humane Society officials they must submit to an audit to receive 2019 funding.